An unexpected memory this year… while I was setting up Christmas lights this year for some reason I remembered the Bubbling Lites. 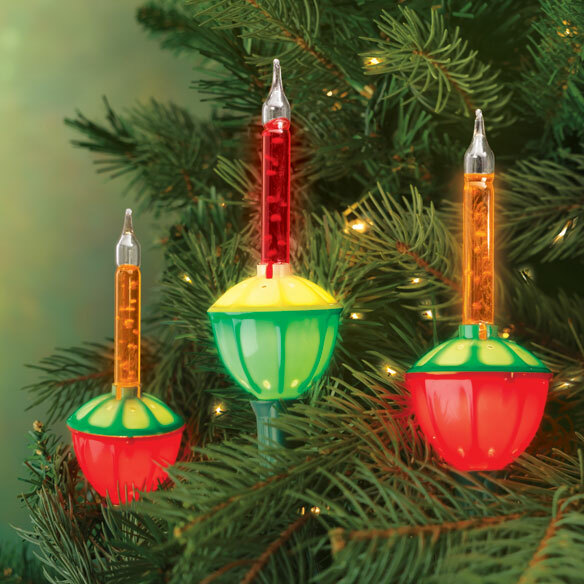 You know those Christmas lights that get hot enough to seemingly boil whatever colored liquid that is in these capsules. I would stare and stare at these lights. They were really quite memorizing. Well for anyone who knows me this will come as no surprise; I secretly kept my eyes open for these lights just in case you could still find them. Well… I found them! They were everything I remembered. Unexpectedly these lights triggered a series of memories that I haven’t thought about in years at my Grandparent’s house. Whether I am thinking about the way the plates looked at Christmas Dinner or the horrible green recliner that sat in the front room I got to thinking about the Happy Faces, Laughing Voices, and Sweet smells of Christmas. Christmas in America, much like everything else, seems to be getting clouded with political correctness and the depressing message of a perceived perversion of a Christian Holiday. But I would like to humbly implore us to look at the Happiness and Joy of the Holiday Season. It is truly a great place where people from all walks of life can bring together traditions of so many cultures and like with so many other holidays create a distinctly American version of this holiday called Christmas. Let’s share our favorite cookies that mom used to bake. Let’s laugh about the outrageous lengths parents would go to fill our children with the Magic of Santa Claus. Let’s sit together on a couch with our coziest blanket and watch Rudolph and the stop motion disaster that we have all come to adore (somehow). How ’bout this… did you place baby Jesus in the nativity scene right away or waited until Christmas Day? Were you the only one in Sunday School who didn’t know what Frankincense and Myrrh were? What are your favorite Christmas ornaments? Is it Turkey, Ham or Both? Does anyone actually know someone who carves the turkey on the dinner table while everyone watches… me neither. Let’s sing our favorite Christmas song. Let’s go to the mall on December 23rd, just for fun. Let’s talk about the time you hoped and hoped that Santa would bring you either Castle Greyskull or Snake Mountain and ended up with both. When was the first time you bought a gift for someone with your own money? Then see their face light up when it was just what they wanted. Let’s restore this beautiful time of year with stories, laughing, and love. Let’s confidently look at each other and say Merry Christmas and a Happy New Year. Doing so will ultimately fill our hearts with hope, peace, joy, and will inherently remind us of God’s promise!